After two days of "sunny 40s," we've got some weather changes to talk about for the rest of the week. Snow/rain showers, a warmup, and then steady/heavy rain. Our streak of quiet, dry weather is about to come to an end. At least Wednesday's forecast is easy and relatively pleasant. We had clouds and flurries passing through the state overnight. As those clear out, we should get more solid sunshine for the first half of the day. Clouds will increase again starting Wednesday afternoon. Meanwhile, temperatures should hold steady, with highs in the lower 40s yet again. Things stay quiet for Wednesday night too. It will be mostly cloudy, dry, and chilly with low temps falling to around 30 degrees. On Thursday, a weak clipper system will make for a complicated forecast and potentially challenging travel conditions. I'm thinking showers will spread into the Garden State starting around 8 a.m. Thursday. With temps still around the freezing mark at that point, initial precipitation will likely be snow. There could be visibility concerns during the last part of the morning rush hour. As Thursday rolls along, warming temperatures in southern and central New Jersey will force a quick changeover to all rain. Could there be a quick coating of snow on cold, untreated surfaces? Sure. Could there be slippery spots? Sure. Further north, I have a feeling we're going to see some light snow/ice accumulations after all. I've decided to ramp up my forecast a bit, calling for the potential for a coating to an inch of snow accumulation. I'm still concerned about a slight chance for a light glaze of ice (due to freezing rain) too — which would be our worst-case scenario. The best chance for a wintry Thursday will be north of Interstate 78 and west of Interstate 287. However, I would include areas along and northwest of Route 1 in my accumulation "buffer zone". It's worth noting that the mesoscale (short-term) NAM model suite is pretty bullish on snow accumulations, painting a bullseye of 2-3" in far North Jersey. Wow. You know, I could see something like that verifying if we see one or two heavier snow bands. However, temperatures will be close to or just above freezing for the duration, and the overall intensity of this storm system will be weak. In fact, on the flip side, the GFS model shows only scattered snow showers and barely a coating of snow. So, is this a major winter storm? No way. Could driving around the northern third of New Jersey become a bit difficult on Thursday? Yes — whether because of wet/slick roads or due to reduced visibility. Could it turn out to be a total dud? Yes — as I mentioned, precip should be pretty light, and temperatures borderline. Should you stay home from work Thursday? Eh, unless you have a lot of flexibility and really don't like icy roads, I think you'll be OK.
Should the state pretreat the roads for this one? Absolutely. Showers should largely wrap-up by around 7 p.m. Thursday, although there could be some lingering stuff Thursday night. The next storm system is the one I've been tracking for almost a week now, and the forecast remains basically the same. Wet, not wintry — highs on Saturday will be in the 50s for most of NJ. While Friday daytime looks dry, bands of rain will move in late Friday night (likely after Midnight). 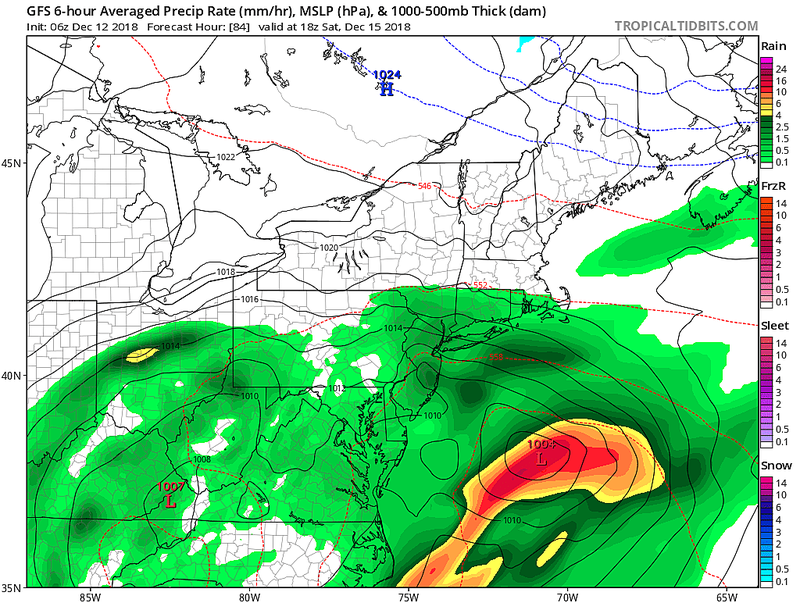 Saturday looks like a very soggy day across New Jersey — probably a total washout. Even though the strongest part of this storm system will stay well off-shore, rainfall total estimates for NJ generally range from 1 to 2 inches. 3+ inches is a possibility, if it really pours. After record rainfall in November and a very wet year overall, more wet weather is really not what we need right now. Flooding of roads, rivers, streams, and creeks will be possible. Even though we pick up a brisk east-northeast wind from this storm, the on-shore flow doesn't look storm enough to produce significant coastal flooding issues. That outlook is very sensitive to the exact direction and speed of the wind, so it's worth monitoring through the weekend. Rain will probably linger through at least part of Sunday. As cooler air works in behind the storm, temperatures will start to fall again too. For now, it does not seem like the cool air will arrive in time to force a widespread transition from rain to snow on Sunday. Having said that, it's a pretty low confidence temperature forecast. At the very least, we'll probably see some lingering snow showers in the refreshed chilly air on Monday.